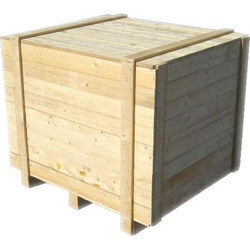 With the high demand in the market, we are betrothed in manufacturing and supplying of qualitative Lightweight Wooden Packaging Box that is widely used in bulk packaging of various products. The provided box is manufactured under the surveillance of our diligent workforce using topmost quality wood and modern tools at our production unit. To avoid any kind of flaw, this box is precisely inspected on several measures of quality in adherence to set industry standards and norms.